Smartlite Digital Displays provides advertisers with a cost-efficient way to make many impressions across a multitude of locations—twenty-four hours per day and seven days per week. Through our network of LED spectaculars, advertisers will be able to project their messages beyond the Times Square “Bow Tie”, expanding visual boundaries. Locations from the west side of Manhattan, along 42nd Street, to as far north as Central Park along 7th Avenue, are available for advertising reach. Five (5) LED Spectacular billboards at 3 Times Square the Thomson Reuters Building, located on the corner of 42nd Street and 7th Avenue, the “Cross Roads of the World”. Three (3) LED Spectacular billboards at 729 7th Avenue, located on the Southeast corner of 49th Street and 7th Ave with visibility from Central Park. All of these LED billboards can be purchased individually or as a network package. All screens allow for full motion video with limited ad placement restrictions 24 hours per day. All screens are positioned to avoid “visual noise” associated with the billboards in Times Square. 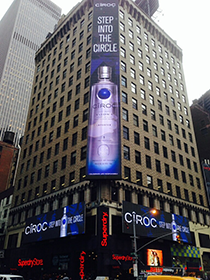 Unique opportunities are available for interactive and experiential marketing in the heart of Times Square.